Great Western Trail is an action selection, card management game by Alexander Pfister, published in 2015 by Stronghold Games. Players take on the role of trail bosses who drive cattle from Texas to Kansas City where the cattle are loaded onto rail cars and shipped across the country. 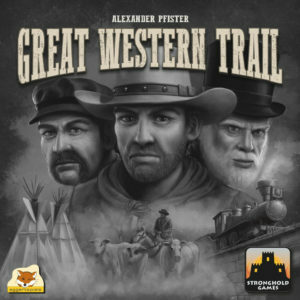 In this first interview for my Gaming the Frontier series, I am thrilled to be joined by Austrian game designer, Alexander Pfister, who tells us the story about Great Western Trail. Alexander Pfister (AP) I’m 45 years old, married and have one daughter. I live in Vienna and work there in the financial business. Due to my latest successes I can invest more time in designing games, my biggest passion. I have been playing and designing games forever. As a kid, I think I was about 12 years old, I designed a game in Africa. About 10 years ago I found the board of this game and made same changes, and it was released in 2015 as Mombasa. (MS) What is the story behind designing The Great Western Trail? (AP) I wanted to do a game set in the US during the 19th century. At first it was more about mines. I liked the worker movement mechanism, because it gives you limited options, but you can plan ahead. I think I started the game in 2010 or 2011, but I put it aside for some years. It was one of these unfinished games where I was stuck. But when I revisited it again, I had some good ideas and showed it to Eggertspiele [a publishing company in Germany]. They decided to publish it, and 18 months later, the game was available in Essen, [Germany]. (AP) Allthough some see it as Western game, I always thought of it as an economic game set in the 19th century. So, I wasn’t inspired by Western movies etc, but more by books from my university time (I studied economics), or games like 1830. (AP) I researched the internet, especially Wikipedia. 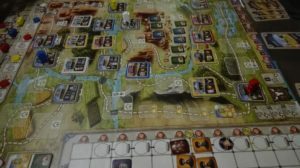 (MS) Would you say The Great Western Trail attempts to capture more of a “realistic” or “romantic” sense of the American Frontier? Why? (AP) Every game abstracts reality. I could not say if it’s romantic or realistic, I would say neither case. I try to bring joy with my games. It should be fun playing and not a historical lesson or a pure realistic simulation of this time. (MS) What challenges did you face when designing the game? For example, was it difficult to find mechanisms to fit the theme? (AP) I first had the mechanism of moving along a path where everybody could build buildings. You could have workers and spend them in your cycle. Only after everybody reached the ending, you would start at the begining again. I was not very happy with this game structure, especially since players waiting for other players did not feel that good. The rescuing idea was that you could control your speed but have an incentive not to move too fast nor too slow. In my mind the theme of driving cattle fits the mechanism very well. (AP) As a cattle driver, a player can pass through Indian territory. The more Indians there are, the slower the player can move along this path. Player can trade with Indians. When trading, a player may loose or make money. Indians, with whom a player trades, don’t slow down the movement anymore. So you could say: Indians, who had not yet contacted with the Americans, slow down the movement of the cattle drivers. Maybe you could say they are more hostile. Or you could say that the Cowboys have to watch out more. Or you could say that the Cowboys don’t get help from the Indians. But after doing trade, they become friends or respect each other. (AP) It’s all the things I said above: White men entering the territory of the Natives. They were living in harmony with nature. So it’s more about white men stealing the land from them. On the other side: How would the US look like if they would not have done this? (AP) There is no violence, no fighting in Great Western Trail. I think this is a big difference to films and books. It is a game feature, not judging about morality. During the game you trade with Indians, and this trading brings white men and Indians together. (MS) What type of experience do you want players to have from playing The Great Western Trail? 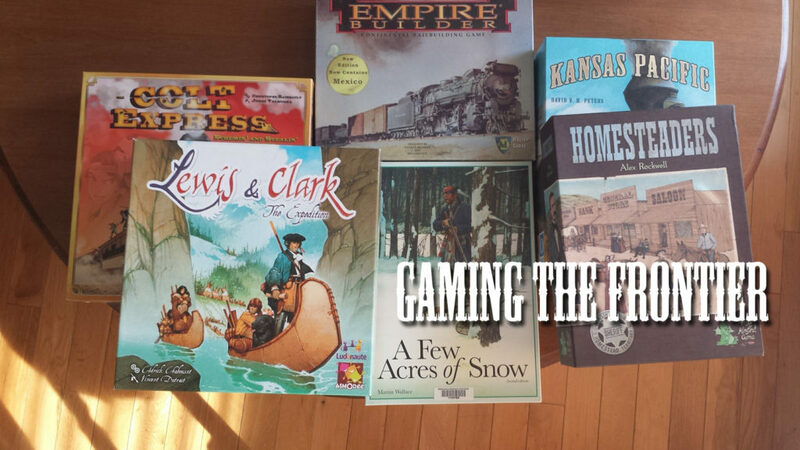 Is there anything specific about life on the American Frontier that you wish for players to experience? And if your game were to be used in an educational context (for example, a high school history class) what would you hope students learn from your game? (AP) Of course you learn that there is something called Great Western Trail and that cowboys drove their cattle from south to north and sold them there. You learn that they were shipped to various cities. But this game should not be a simulation or historical lesson, you should have fun playing it. (MS) Your game has only been out for a few months, but do you know if your game has been used in any classrooms? If so, what feedback have you received? (AP) I don’t know and honestly would not recommend it as it is a complex game. You have to learn the rules for 30 minutes, and what you learn is pure game mechanics not so much about history. I think there are more easier games out there, which might serve the same purpose. (AP) If you like playing deep games, Great Western Trail is a good choice. If you are more interested in history, I think that there are better and far easier games out there. My deepest appreciation to Alexander Pfister for taking the time to answer these interview questions. 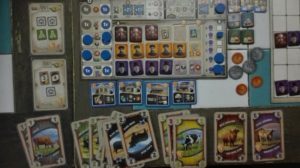 For more information about Great Western Trail please visit the game’s entry on BoardGameGeek.com. One Response to "Great Western Trail – interview with Alexander Pfister"